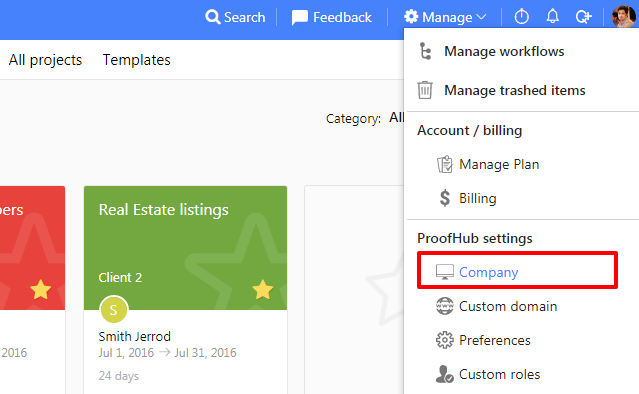 ProofHub settings allow you to give your account a personalized look and feel. You can white label it by color, logo, or customize URL. Select any color to make it your account theme from Account theme color. You can anytime rename or change the company name. 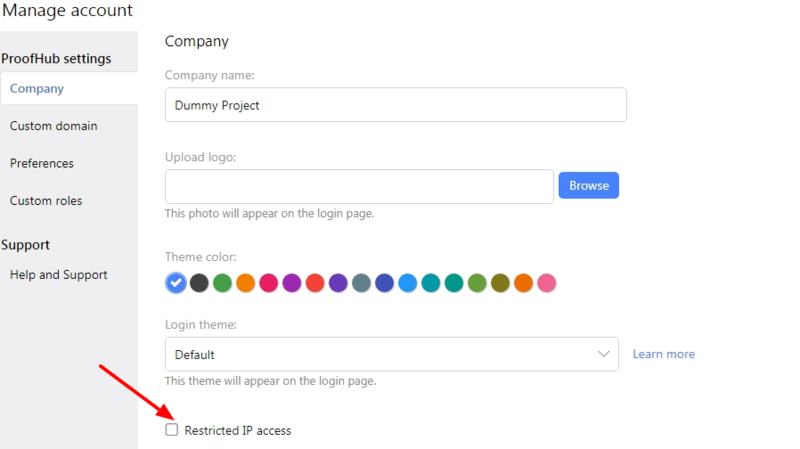 Click the Browse button to upload your company logo and it will appear on the sign in page. Click the dropdown menu besides Login theme and select any theme to set it for your account. You can change the format of date by clicking the dropdown menu from Date format. You can also start your week either from Monday or Sunday by clicking the Start week from and select your desired option. If you do not want to receive any email notification for your account and for all users then you can select the checkbox beside Turn off all email notifications for your entire account and all users. Similarly, select the checkbox Turn off all milestones in Gantt chart if you do not want to see milestones in gantt charts. This feature allows you to restrict IP addresses of users so that they can access their accounts from specific IPs only. Select the checkbox of Restrict people to access ProofHub only from specific IPs. Enter the IP addresses for which you want to give access to users. Only the account owner will be able to access the account from any location even after the IP restriction is applied.